Powder metallurgy may be best described as the following process: Metal powders are firstly consolidated into a shape under pressure. The resultant compact is then sintered at a temperature below the melting point of the major elements so that bonds are formed between the particles while retaining the shape of the compact. Plain iron powder and a combination of other elements and additives are blended together into a fully homogeneous mixture. Each blend is tailored to meet the exact physical requirements of the finished component. Mixing can be performed by the powder supplier or the P/M parts manufacturer. 2-tonne conical blender for on-site mixing giving greatest consistency and exibility. The blended powder is transferred to a bulk hopper and placed above the powder compacting press. Powder compaction, also known as powder pressing, is the process of compacting metal powder in a die through the application of high pressures. Typically the tools are held in the vertical orientation with the punch tool forming the bottom of the cavity. The powder is then compacted into a shape and then ejected from the die cavity. A controlled amount of powder is fed into a precision die and is compacted. Dimensions and density are closely controlled in this process. The compacted component is said to be in the “green” state. GTB has over 30 compaction presses ranging from 6 to 350 tonnes capacity, and warm compaction capability which allows increased density for improved physical properties. The density of the compacted powder is directly proportional to the amount of pressure applied. To attain the same compression ratio across a component with more than one level or height, it is necessary to work with multiple lower punches. A cylindrical workpiece is made by single-level tooling. A more complex shape can be made by multiple-level tooling. Production rates of 15 to 30 parts per minutes are common. After pressing, the “green” parts are sintered by passing them through a furnace in which both temperature and atmosphere are strictly controlled. The part is heated to just below the melting point of the principal material so that the particles are fused, or sintered, together into a solid mass. 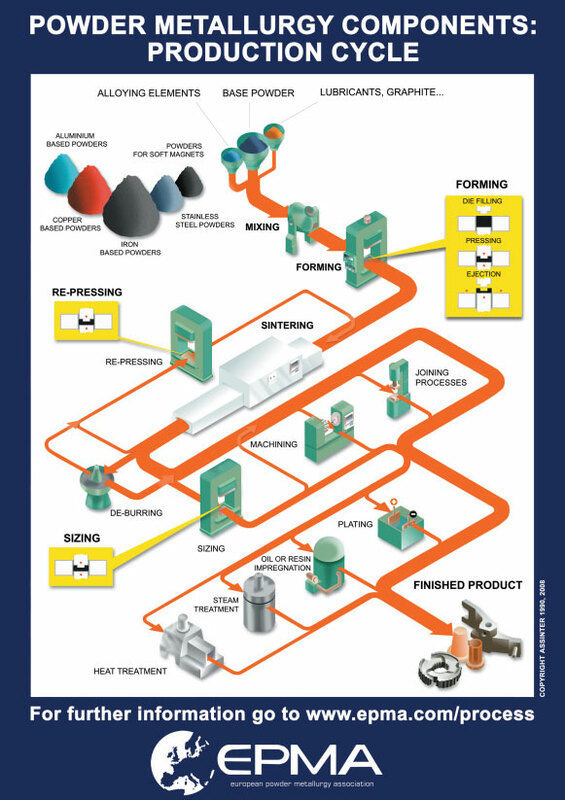 GTB has a potential sintering capacity of over 5000 tonnes P.A. from 6 furnaces. Recent acquisitions include high-temperature furnace and vacuum furnace, allowing parts to be produced to near full density for increased physical properties.